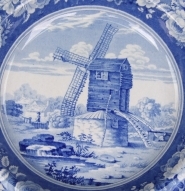 An earthenware soup dish with a view of Powder Mill, Hastings. The mill was used to make gunpowder and was located near to the site of the Battle of Hastings (1066). This is one of 16 patterns in Mason's Beaded Frame Mark Series, many of which bear the title of the pattern in a beaded frame, hence the series name.